A new operational procedure to cut the amount of time aircraft circle in ‘holding stacks’ at London Heathrow Airport is set to begin today (1 April). Traditionally NATS, the UK’s air traffic service provider, has only been able to influence an arriving aircraft’s approach to Heathrow once it enters UK airspace – sometimes only 80 miles from the airport. This limits the opportunity to manage the flow of traffic and can result in additional time spent in the holding stacks. From today, if delays in the Heathrow holding stacks begin to build, air traffic controllers in the Netherlands, France, Scotland and Ireland will be asked to slow down aircraft up to 350 miles away from London to help minimise delays on arrival. 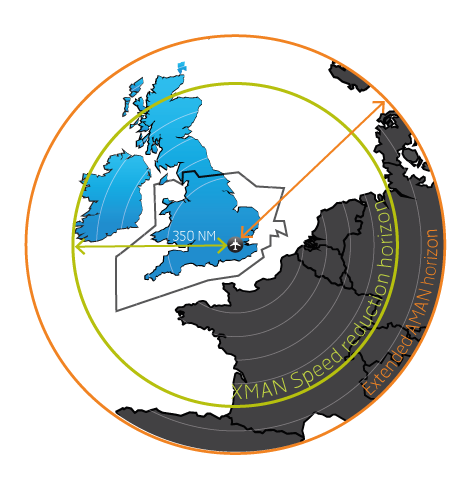 The trial is being led by NATS in close cooperation with French air traffic control provider, DSNA, the Maastricht Upper Area Control Centre and Prestwick Control Centre, with the aim of cutting average holding times by at least a quarter from the current time of just under 8 minutes. In a pre-trial test of the system, the first ever live data – flight BAW74 – was passed between NATS and French air traffic controllers at DSNA’s Reims control centre in the early hours of 21 March 2014. Gerald Regniaud, Project Leader for Reims Area Control Centre, explained: “A dedicated HMI has been specifically developed to display London-Heathrow Arrival Management Information directly at the Control Working Position. Thus, from 350Nm out of the runway, when aircraft are still at cruising level, they will have their speed controlled in order to absorb up to 3 minutes of delay”. The trial, which is a partnership between members of FABEC and the UK/Ireland FAB, will run until the end of 2014.